The Denver Young Artists Orchestra presents their season finale, featuring Prokofiev’s Fifth Symphony and the Concerto Competition winner. 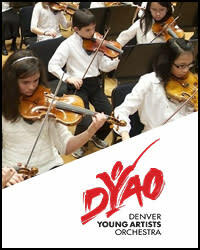 Learn more about the Colorado Symphony and DYAO alliance at coloradosymphony.org/DYAO. This is a performance by the Denver Young Artists Orchestra and does not include members of your Colorado Symphony.